The cyan of this deep image shows the 2-million-light-year-long nebula of diffuse hydrogen gas that traces the filament of the cosmic web. For the first time, astronomers have captured an image of the diffuse "cosmic web" of gas that stretches between galaxies. The structure, which contains most of the material in the universe, mirrors the distribution of elusive dark matter. By using the radiation from a distant quasar, the brightest objects in the universe, the international team of scientists captured the previously unseen threads stretching between galaxies. Computer simulations suggest that matter in the universe exists in a "cosmic web" that stretches between the nodes made up of galaxies. The insert shows a 10-million-light-year segment from a simulaton that inclues both gas and dark matter. Galaxies, filled with billions of stars, seem enormous, but they only make up a small percentage of the material in the universe. They serve as nodes where gravity draws matter together. Computer simulations suggest that long filaments connect the distant galaxies. These web lines contain hydrogen gas left over from the start of the universe. Cantalupo and his team used the radiation from a quasar to light up the threads stretching between galaxies. Quasars are born from supermassive black holes, and lie at the center of the galaxies, in some of the densest parts of the web. Such quasars can light up not only the gas around the galaxy but also the material stretching away from it. 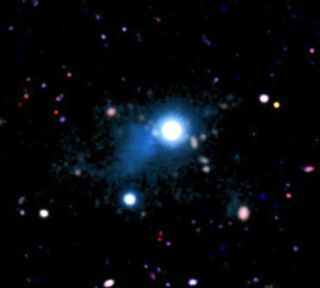 "The quasar is illuminating diffuse gas on scales well beyond any we've seen before, giving us the first picture of the extended gas between galaxies," J. Xavier Prochaska, also of UC Santa Cruz, said in the statement. "It provides a terrific insight into the overall structure of the universe." As the universe expands, it stretches the light coming from the quasar, which lies approximately 10 billion light-years away. Cantalupo and his team built a special filter for the 10-meter Keck Telescope in Hawaii to detect only the shifted wavelength. The nebula of gas gathered along the filament spans almost 2 million light-years across the universe, stretching out between the galaxies. "This is a very exceptional object," Cantalupo said. "It's huge — at least twice as large as any nebula detected before, and it extends well beyond the galactic environment of the quasar." The team's research was published Jan. 19 in the journal Nature. The structure of "normal" material in the universe is thought to mirror the distribution of dark matter. Although scientists have not yet been able to directly observe dark matter, research shows that it makes up almost 85 percent of the matter in the universe. Galaxies sit within halos of dark matter. Filaments of the missing material stretch between the universe. Thanks to gravity, ordinary matter follows its distribution, so filaments of ionized gas, such as those found by Cantalupo and his team, should echo the placement of dark matter.